An investor group bought a derelict railroad from the state of Michigan in 1847 and turned it into one of America’s most important regional lines. Developing an expanded route beyond Kalamazoo to St. Joseph would bring the line over “execrable” highways. It was semi-wilderness, and no one dared drink the water. “Our tongues were parched like fever patients,” Forbes wrote in a vivid account. The privately owned Detroit and St. Joseph Railroad had started from Woodward and Jefferson avenues in 1836, but even the city of Detroit’s investment of $50,000 couldn’t sustain the venture more than a year. Envisioning the line as one of three parallel crossings of the Lower Peninsula, Gov. Stevens Mason — the 26-year-old “boy governor” — bought it as part of a $5-million scheme for railroads and canals, a promotion that ultimately heaped debt and disgrace upon Michigan. The state-owned Central Railroad of Michigan languished for most of a decade. Then, sensing opportunity in 1846, Brooks, a civil engineer, recruited the Bostonian, Forbes, a veteran of the China trade, to the railroad business. News of the line’s availability had spread through the efforts of James Joy, a Harvard Law School graduate who was a partner in Detroit’s Porter and Joy law firm. Forbes enlisted Joy to organize the new Michigan Central Railroad Co., started sale negotiations with the Michigan Legislature, and created a financial syndicate for the purchase. At first, the Legislature hesitated to sell to Eastern capitalists, whom they “supposed to be unscrupulous pagans,” historian George Catlin wrote. Pious lawmakers, meanwhile, wanted no Sunday trains and demanded the railroad’s directors attend church twice on the Sabbath. Finally, a $2-million deal was struckâ€…—â€…$500,000 down and the remaining $1.5 million due in a year. Brooks now oversaw Michigan Central’s daily operations. Soon after, the service reached Lake Michigan at New Buffalo, and lake steamers were added to complete the final leg to Chicago. To speed up the trip, Joy lobbied the Indiana and Illinois legislatures for rights to cross those states. He and Forbes shrewdly invested $800,000 in the Illinois Central, which had received 2.6 million acres of land from Congress, and Michigan Central inaugurated direct service to Chicago in 1852. “Michigan Central was the first railroad to be built with an eye on the long haul as well as the short,” wrote historian Robert Conot. Eventually, it would lease tracks in southern Ontario, bringing a connection to Buffalo and a union with the New York Central. Forbes, Joy, and Brooks were diverted from the railroad operations because of a side project: building the ship canal at Sault Ste. Marie, which was completed in 1859. Joy organized other railroads, too, but in 1867 he returned as Michigan Central president. The railroad’s iron tracks were soon replaced with steel ones costing $130 per ton. To transport natural resources from forests and mines, Joy promoted new lines across the Lower Peninsula, bringing them into the Michigan Central system. By 1925, there would be 4,139 miles of track and 1,871 miles of road, logging 4,304 million net ton-miles of revenue freight and 600 million passenger-miles. Under Joy’s leadership, Michigan Central benefited from consolidation. By the time he died in 1896, however, it had come under the New York Central’s control. 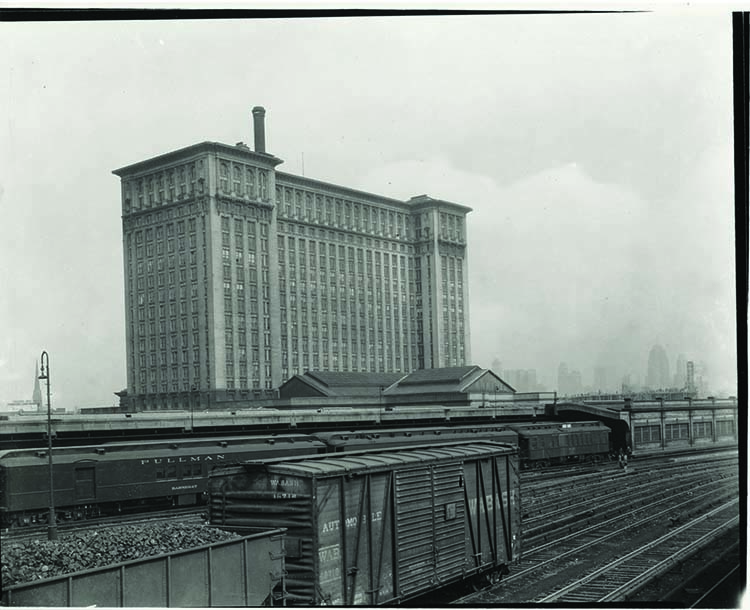 Decades later, the Penn Central line was formed, encompassing Michigan Central. With Penn Central’s 1970 bankruptcy, regional railroads received a government bailout in the form of Conrail. From there, Norfolk Southern acquired the company and CSX in 1997, and today Norfolk Southern, along with Amtrak, operate the vestiges of the Michigan Central.